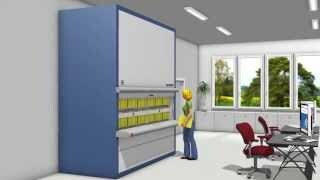 Hänel Storage Systems manufactures industrial and office vertical carousels and vertical lift module (VLM) storage systems, as well as HänelSoft inventory management software and microprocessor-based controllers. 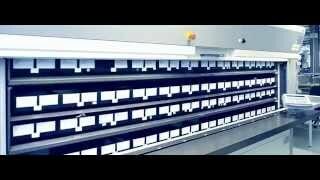 The Rotomat® vertical carousel is based on the Ferris Wheel principal, delivering inventory items to the user at a single, ergonomically-correct access point. 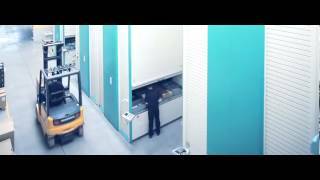 Dual drive motors ensure reliable operation, and a range of shelves, drawers, dividers and bins provide maximum storage flexibility. 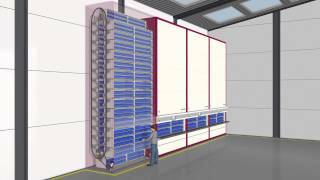 The Lean-Lift® vertical lift module is available up to 65' high with shelf capacities up to 2,200 lbs. each. Advanced features include pick-to-light item identification, dynamic weigh scale for accurace weight management and the ESB system that allows operation to safely continue in the event of a fault in a mechanical system. 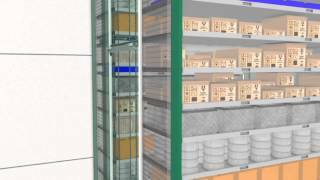 Hanel is recognized worldwide as a leader in vertical storage technology, manufactured under ISO 9001 certification.